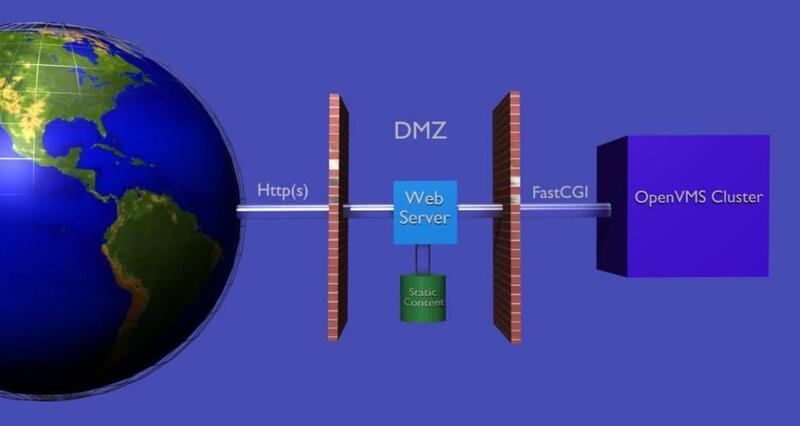 FastCGI is an protocol that allows a web server to connect to application servers on either the same or remote systems eliminating most of the overhead associated with normal CGI interfaces and providing increased security and scalability. The FastCGI software developed by DSI allows direct connection to OpenVMS RMS databases as will as interfacing with programs written in most OpenVMS languages. For more information on FastCGI, see www.fastcgi.com. Many thanks to Rob Saccoccio for his assistance and support through the FastCGI newsgroup. These programs have been is use since early 2000 and have been extremely reliable. The only change was required by the upgrade to TCP/IP services V5.0A. If you have trouble with FASTCGI_SETUP on an earlier version, please contact us. These programs are written in OpenVMS Basic so they conform to the OpenVMS calling standard. This allows creating a web interface to existing OpenVMS applications in Basic or Cobol without significant changes to the business logic. If you want to use FastCGI to connect to C, you are probably better off downloading the FastCGI library from www.fastcgi.com. The secure web server can be any server that supports FastCGI such as Apache or the DSI Secure Web Server which runs on OpenVMS.